Map Of The Territory Of The United States From The Mississippi To The Pacific Ocean. Reduced section, general map, North America, 1795. 1 : 18000000 Winterbotham, W.
Map Of The Territory Of The United States From The Mississippi To The Pacific. Reduced section, map of North America, 1826. Reduced section, territory west of Rocky Mountains, 1837. 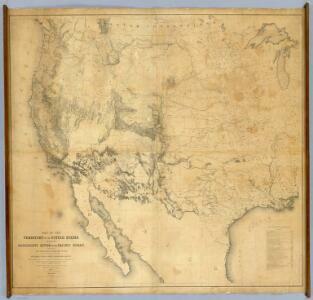 1 : 6000000 Emory, William H.
National Map Of The Territory Of The United States. 1 : 3801600 Keeler, William J. 1 : 14606381 Clemens, Rev E.J. 1 : 7500000 Lloyd, H.H. 1 : 7500000 Gray, Ormando Willis; Walling, H. F.
1 : 7500000 Walling, H. F.
United States and Contiguous Territories: Federal Reserve Districts, Commercial Airways, Highways, and Railroads. 1 : 17398000 Hammond, C.S. Zoological Divisions of the United States. 1 : 12400000 Cope, Edward D.
Botanical Divisions of the United States. 1 : 12400000 Porter, Thomas C.
Composite: United States of North America.